Here’s an amazing baby book like no other. 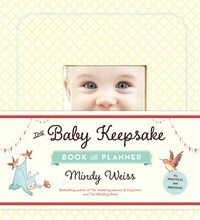 For one, because The Baby Keepsake Book and Planner is in a binder, it’s completely guilt-free and customizable. Forgot to record baby’s first steps? No matter, just tear out that page. Is your baby adopted? No need to avoid the pages about your birthing experience; instead, add pages about your journey to adoption. Second, it combines the precious and the practical. The binder includes six tabbed dividers with pockets, covering pregnancy through age four. Then inside are 104 full-color pages, including everything from checklists, doctor’s notes, menu planning charts, vaccine and immunization schedule to All About Us, First Feelings, Your Favorite Things, Birthday Party Memories. In addition, there is a plastic pouch for odd-sized memorabilia like a hospital bracelet; ten pages of heavyweight stock to mount photographs and other visual memorabilia; a foldout growth chart (on the underside of the belly band); and a keepsake envelope for a lock of hair. This perfect baby shower gift is as stylish as it is useful. In the same format as the author’s category-killing Wedding Planner & Organizer, it is inspiring, easy to use, and fun—and will be a memento to hand down from one generation to the next.